Here’s a math equation you’ll actually like: Amazing celebrities + fantastic, orange blimps + TONS OF SLIME = the best award show ever – the Nickelodeon Kids’ Choice Awards! The renowned and prestigious Nickelodeon Kids’ Choice Awards is one award show that we all get so excited for and we eagerly wait for it to make its way on over to celebrate kids’ favorites in pop culture. This award show is one event that people of all ages love and enjoy. For the kids, it’s an award show that is filled with so much fun (and slime) and an endless amount of terrific moments. For teens and young adults, it helps us relive all of our favorite childhood memories and honors the things we can’t get enough of in the entertainment world – from social media trends to blockbuster hit movies and beyond. And for adults… well, who doesn’t want to see their kids gleaming with joy while they watch the Kids’ Choice Awards?! Once again, Nickelodeon surpassed everyone’s expectations with another stupendous and extraordinary Kids’ Choice Awards, which took place on March 24, 2018 at the Forum in Inglewood, California. This year’s award show was even bigger, better and SLIMIER than years prior. WWE icon John Cena did a magnificent job being the host with the most for the second year in a row at the KCAs. He brought his unrivaled energy to the award show and he even brought some of his Cena “family” members to join in on the fun. For example, below, we see Fuller House‘s Candace Cameron Bure feeding baby Cena. We also can’t forget Nana Cena’s appearance at the award show too – talk about a whole lot of laughs! Some of the many unforgettable slime attacks that took place at the KCAs included Heidi Klum and Mel B getting slimed while presenting an award on a swing-set hovering over a slime pool (sounds risky to begin with! ), Liza Koshy (who won the award for Favorite Funny YouTube Creator at the event) was slimed not just once but twice at the event and our #bae Shawn Mendes even got buckets of slime poured on him as a surprise from Henry Danger‘s Jace Norman. 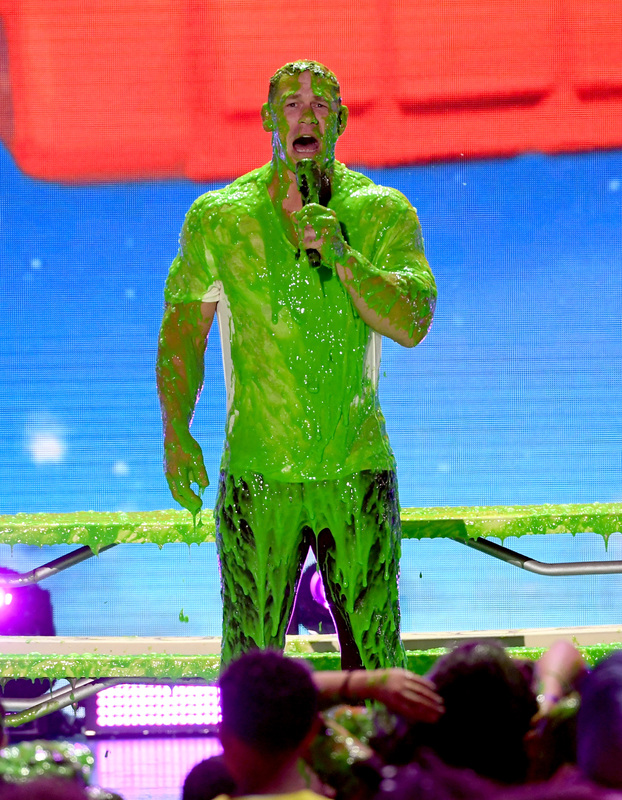 The Nickelodeon Kids’ Choice Awards ended off with the host himself, Mr. John Cena getting a slime pouring after the crowd got a share of slime too. The outstanding KCAs got everyone up on their feet with two, spectacular performances. Multi-threat JoJo Siwa took on the stage and brought extra happiness to the event with a fabulous medley of her hit songs “Kid in a Candy Store,” “Hold the Drama,” and “Boomerang.” The lovely and accomplished, young lady also won the award for “Favorite Musical YouTube Creator” at the event. The profound band, N.E.R.D. got everyone dancing along to their exceptional performance of their chart-topping track “Lemon” and had a bunch of talented, kid dancers up on stage to dance along with them. It definitely was one big ‘ol party at the Nickelodeon Kids’ Choice Awards. The KCAs gave the power to the kids and it was all up to YOU guys to help your favorite celebs win big at the award show. Fans were able to vote in a total of 19 categories including four new ones: “Favorite Funny YouTube Creator,” “Favorite Musical YouTube Creator,” “Favorite Dance Trend” and “Favorite Instagram Pet.” In fact, fans were even able to have their voices heard and join in on some live moments at the KCAs. Fans were able to vote and see Black-ish star Marsai Martin wear a pair of “Guac Socks” (yes – it’s as gross as it sounds – guacamole socks!) in an “Eat It or Wear It” challenge. Social media stars and YouTubers Alex Wassabi and LaurDIY took part in a “Fear Box” challenge that fans were able to vote on what they stick their hand into. This award show emphasized the importance of kids being kids and cherishing their childhood. It’s fun to be a kid! Social media sensations also had an excellent time being Nickelodeon’s KCA prankstars at the event. Brooklyn and Bailey, Alex Hayes, the Stokes Brothers and more took on some challenges and had an epic, prank battle amongst one another. Other celebrities in attendance at the event include Jace Norman, Kira Kosarin, Jack Griffo, Breanna Yde, Lance Lim, Jade Pettyjohn, Aidan Miner, Ricardo Hurtado, Tony Cavalero, Lilimar, Owen Joyner, Savannah May, Lexi DiBenedetto, Amarr Wooten, Daniella Perkins, Madisyn Shipman, In Real Life, Forever In Your Mind, Riele Downs, Ella Anderson, Lizzy Greene, Peyton List, Storm Reid, the cast of Nickelodeon’s new show, Star Falls: Siena Agudong, Kamaia Fairburn, Jadiel Dowlin, Marcus Cornwall and Tomaso Sanelli, YouTuber Annie LeBlanc, Addison Riecke, Sofia Reyes, Aubrey Miller, Ser’Darius Blain, the cast of Hunter Street: Stony Blyden, Daan Creyghton, MaeMae Renfrow, Thomas Jansen, Kyra Smith, Kate Bensdorp, Wilson Radjou-Pujalte, and many more. So many celebrities took this time at the Nickelodeon Kids’ Choice Awards to encourage kids to stand up for what they believe in and make a difference in this world. It’s so wonderful seeing a network like Nickelodeon motivate kids to work hard and follow after their dreams and by doing so, they can achieve anything and everything. I, Alexisjoyvipaccess had the greatest honor of covering and attending the 2018 Nickelodeon Kids’ Choice Awards and had the most incredible time once again at this phenomenal event. Check out some more pictures below from the KCAs and be sure to stay tuned on YouTube.com/alexisjoyvipaccess for interviews with your favorite celebrities from the event. Check out the full list of winners at the 2018 Nickelodeon Kids’ Choice Awards below! Previous Article: Jaylen Barron Looked So Lovely At The “Santa Clarita Diet” Season 2 Premiere! Next VIPAccessEXCLUSIVE: The “Star Falls” Cast Interview With Alexisjoyvipaccess At The 2018 Nickelodeon Kids’ Choice Awards!